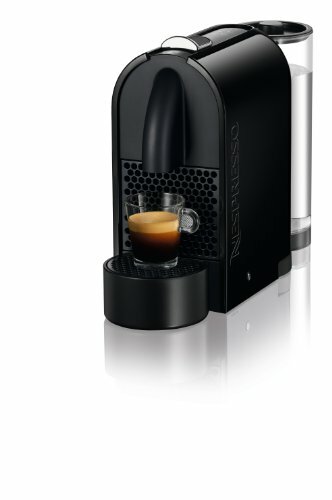 The Nespresso U D50 is a single-serve brewer that is compatible with old-style Nespresso capsules (i.e. not the dome-shaped VituoLine range). The U D50 works with three serving sizes, ristretto, espresso and lungo. It features reprogrammable water volume and comes equipped with a memory function, which allows the user to save their preferred settings. The removable water tank has 28oz capacity and the brewer can hold up to 13 used capsules. Additional features include automatic shut-off and a fast heat up time. The 19-bar pressure ensures optimal extraction and users can choose from compatible Nespresso capsules, which are purchased separately. Overall, the Nespresso U D50 is a well-made brewer that is neither the most attractive nor the cheapest in the range. However, it gets the job done as easily and conveniently as you would expect from one of the leading manufacturers of this type of brewer. Note that as the U D50 is one of Nespresso’s older coffee machines models it may not be readily available in the US. This particular model does not come with built-in milk heating/frothing capability. However, the Nespresso Aeroccino Milk Frother can be bought separately for around $70 (list price). The Nespresso U D55 (or Nespresso UMilk) does feature an integrated milk frother. Nespresso brewers are usually sold new with a sampler pack of capsules. At first glance, the U D50 looks like your typical Nespresso brewer. Further exploration reveals that is exactly what it is! From design to operation to coffee quality, for anyone who has used or seen a Nespresso machine, the U D50 is a familiar piece of equipment that performs pretty much how you would expect. For anyone unfamiliar with this type of brewing, you simply select the coffee capsule of your choice (from the compatible Nespresso range) and place it in the compartment. Ensure there is water in the tank and then press the appropriate button. Within a few seconds, you will be enjoying your espresso or lungo-based beverage. The spent capsule is ejected into the removable drawer ready for recycling. While operation across the full range of Nespresso brewers is pretty uniform, at least in terms of concept, each of the models in the family do differ from each other. So how does the U D50 stack up? The first thing to note about the U-series of brewers that you also have the option to brew ristretto (in addition to espresso and lungo). The factory presets measure these serving sizes as 0.84oz, 1.35oz, and 3.7oz but you can also adjust the water volume to tailor your drink to your own tastes. Simply select which beverage size you want via the dedicated top-mounted buttons. Hold down the control button under the slider panel (where the capsule compartment is located) to make adjustments. The U D50 also memorizes your drink selection, so if you always choose the espresso option, for example, it will automatically select this each time you brew. In addition, you can top up the brewed coffee with extra hot water and change the selected cup size during brewing by simply selecting a different option. The magnetic cup holder can be shifted out of the way to accommodate taller cups or glasses. The U D50 features a light indicator for letting you know when the tank needs topping up with water. Handily, the water tank swivels by 180 degrees, making it easier to fill and giving you the option of having it positioned to the right or left of the unit. Additional features include automatic shut-off after 9 minutes of inactivity, which can be adjusted up to 30 minutes. Negatives are few and far between on the U D50. The 28oz water tank is not the largest (for example, the Citiz range holds 34oz) but it is more than respectable for most needs (holding enough for about 7 lungo-size cups or about 20 expresso cups) and it does mean the unit is quite compact. Issues raised by third party users are mainly operational and relate to specific units malfunctioning. These include leaks and failure to pierce the capsule, resulting in a wasted pod. Other issues highlighted are more generally Nespresso-related, such as the cost of the coffee capsules. Finally, it’s worth noting the design of the U D50, as this may be a factor for some users. It is well known that all of the Nespresso models feature distinctive, some may say iconic, designs to suit different tastes and styles. In truth, if this were a Nespresso beauty contest, the U D50 would not be a winner, as it’s one of the plainer models (and the black color option does look quite ‘plastic-y’). That being said, if you like a more minimalist, functional design, you might love the look of the U D50! Overall, this is a decent capsule brewer that takes its place among the manufacturer’s other models. Should you go out of the way to hunt down a U D50 ahead of another Nespresso model? No. Will you be impressed by what the U D50 can produce? If you like this type of coffee, you’re unlikely to have too many complaints. Keeping the U D50 running smoothly is pretty straightforward. The drip tray and used capsule drawer can be taken out and cleaned with hot soapy water and the external parts of the brewer can be wiped down with a soft cloth. Periodically, the unit will need descaling using the dedicated cleaning mode and descaling solution. The manufacturer also recommends running through two brewing cycles with plain water when you first get the machine before you start making drinks for consumption. The U D50 is just as convenient as other models in the Nespresso range, with a couple of extra features not available on some of the other brewers. Most notably, the U-range offers 3-size functionality (ristretto, espresso, and lungo) with reprogrammable water volume so you can really tailor your coffee experience. Note that this brewer is not as readily available as other models in Nespresso’s range and, honestly, it’s really not worth the extra hassle of tracking one down. The Pixie, Citiz or new VirtuoLine range are just as good, if not better at getting the best out of Nespresso capsules. Pros: Offers full single-serve functionality with the bonus of 3 reprogrammable serving sizes. The U D50 is as easy to use and maintain as you would expect from a Nespresso brewer. Useful features include the pivoting water tank and the memory feature that remembers what drink you like. Cons: There are cheaper and prettier Nespresso models on the market that get the job done just as well. A few third party reviews have flagged some operation issues with individual units. 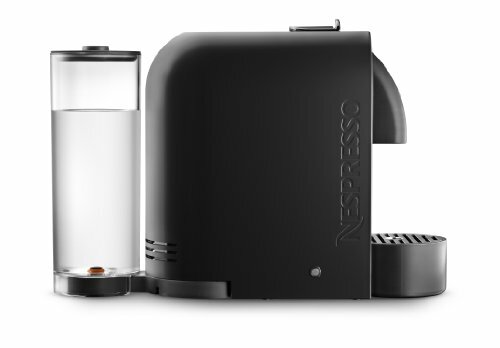 At 28oz, the water tank is not the largest of the Nespresso range. Users are limited to (relatively costly) Nespresso capsules. In a sentence? 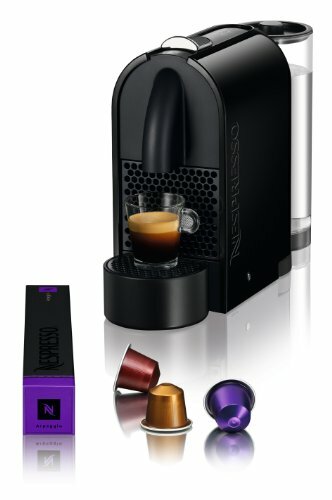 The Nespresso U D50 is another in the manufacturer’s line of convenient, single-serve pod brewers – this one offers espresso, lungo, and ristretto options (and remembers which one you prefer), which about the only feature that puts it ahead of similar pod coffee brewers in the Nespresso family.